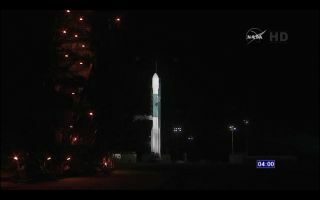 NASA's Soil Moisture Active Passive mission (SMAP) awaits launch aboard a United Launch Alliance Delta II rocket at Vandenberg Air Force Base in California. The first launch attempt on Jan. 29, 2015, was scrubbed due to high winds. The launch of NASA's newest Earth-gazing satellite will have to wait another day due to high winds that made launch too risky Thursday (Jan. 29). The space agency's Soil Moisture Active Passive satellite (SMAP) mission was set to launch to space today (Jan. 29) at 9:20 a.m. EST (1420 GMT). High altitude winds, however, prevented the United Launch Alliance Delta II rocket carrying SMAP from taking off from Vandenberg Air Force base in California. NASA officials delayed the launch minutes before the 3-minute launch window opened. NASA's SMAP, or the Soil Moisture Active Passive satellite, will measure groundwater content and frozen/thawed state, all over the world every three days. See how the SMAP dirt-tracking satellite works in this infographic. "We had a beautiful countdown," Tim Dunn, NASA launch manager, said during a webcast after the delay was announced. "Everything on the Delta II rocket was rock solid. The spacecraft had absolutely no issues … The one thing that was kind of dogging us through the countdown was those upper-level winds … Unfortunately today, both from a loading on the rocket and a controllability of the rocket, we were in a condition with upper level winds that we just did not have the capability to fly the Delta II safely through the maximum dynamic pressure region of flight." Officials expect a 90 percent chance of good weather for launch Friday (Jan. 30). NASA's SMAP mission is designed to monitor the moisture content of soil on Earth. The satellite is expected to create a global map of soil moisture once every two to three days, providing scientists with unprecedented data about droughts and floods. The soil moisture information can help researchers craft better weather forecasts and understand more about the interconnected nature of Earth's water, energy and carbon cycles, according to NASA. "SMAP is in a unique position because its measurements impact two distinct domains," Dara Entekhabi, SMAP science team leader, said during a news conference Tuesday (Jan. 27). "One, of course, as a science mission it impacts how we fundamentally understand how the environment works and peer into the metabolism of the environment. And second, it impacts some of the applications that touch our everyday lives." Once launched, the 3-year, $916 million SMAP mission will join the other Earth-gazing missions currently monitoring the planet from space today. SMAP will be in a polar orbit that takes it about 426 miles (685 kilometers) above Earth's surface. The satellite comes equipped with a huge, nearly 20-foot (6 meters) rotating mesh antenna that is currently folded up but will be deployed after the spacecraft reaches orbit. Follow Miriam Kramer @mirikramer. Follow us @Spacedotcom, Facebook and Google+. Original article on Space.com.